NEGROMANCER 2.0: VIZ Media Preps "Gangsta" Prequel, "Gangsta: Cursed"
VIZ Media Preps "Gangsta" Prequel, "Gangsta: Cursed"
VIZ MEDIA LAUNCHES A PREQUEL FOR THE HIT MANGA SERIES GANGSTA WITH THE RELEASE OF GANGSTA: CURSED. 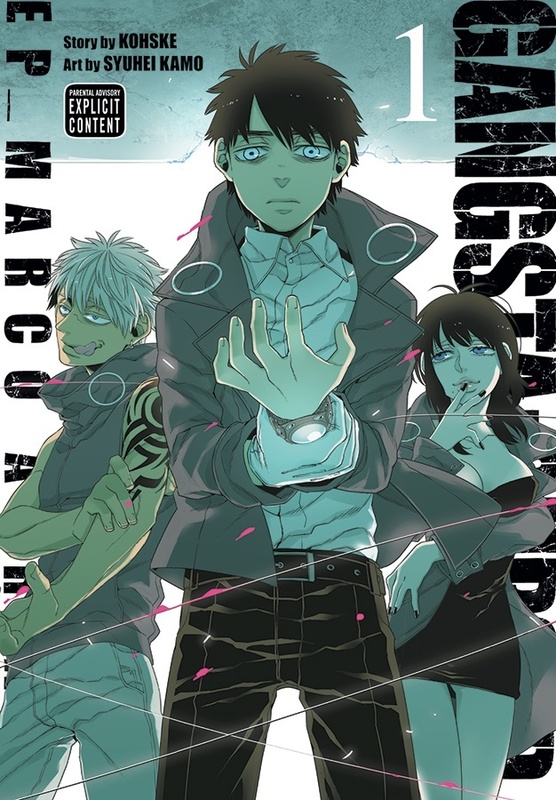 San Francisco, CA – VIZ Media, LLC (VIZ Media), a premier company in the fields of publishing, animation distribution, and global entertainment licensing, expands the mysterious world first depicted in the manga crime thriller, GANGSTA., with the release of a new spin-off series, GANGSTA: CURSED., on Tuesday, December 20th, 2016. The edgy new manga features story by Kohske, the creator of the original GANGSTA. series, with artwork by Syuhei Kamo, and contains prequel stories for several of the main characters that appeared in the initial series. GANGSTA: CURSED. is rated ‘M’ for Mature Readers and will be published in print under the VIZ Signature imprint with an MSRP of $12.99 U.S. / $14.99 CAN. The original GANGSTA. manga series (also published by VIZ Media, rated ‘M’ for Mature Readers) has been a repeated Bookscan Top 50 as well as New York Times bestseller and has also inspired a popular anime adaptation. In GANGSTA: CURSED., killing is all Spas has ever known, and he does it without doubt or remorse. Taught to believe he’s ridding the world of monsters, he sees the extermination of the Twilights as a necessary step toward making Ergastulum a safer place. Until the day when he’s forced to confront the horrifying truth that the real monster might be…him. Manga creator Kamo began his professional career working on the original GANGSTA. series as an assistant to the series creator, Kohske. Gangsta: Cursed. is his first series. GANGSTA. creator Kohske made her manga debut in 2009 with the short story “Postman” which appeared in Shonen GanGan magazine. Her first full-fledged series, GANGSTA., began running in Monthly Comic Bunch in 2011 and became an instant hit. More information about Kohske’s work can be found on her website at: http://gokohske.o-oi.net/. For additional information on manga titles published by VIZ Media, please visit www.VIZ.com. Image Comics Announces "Planetoid: Praxis"